On June 25, 2018, the Embassy announced that it will no longer require South Korea visa applicants to submit their company alphalist. The new policy takes effect on July 1, 2018. However, the Embassy notes that some applicants may still be asked to present the requirement when deemed necessary. The Embassy also reminds Korea visa applicants to take note of the new application procedure, which will be through designated travel agencies. This also takes effect on July 1st. Beginning July 1, 2018, the Embassy will no longer require Korea visa applicants in the Philippines to submit their company alphalist. The change in policy is made three months after they have added the alphalist to the list of requirements for employees. However, there may still be cases when some applicants would still be asked to present this requirement. This will only be to support their Korean visa application when the Embassy finds it necessary. As of this writing, only those who are first-time travelers and those who have not visited an OECD-member country are required to submit the company alphalist along with a copy of their BIR Form 2316. Citing Salarium's definition, "the BIR Alphabetical List or alphalist is an attachment to the BIR Form 1604-CF," which is a return filed by employers who are required to deduct or withhold taxes to the compensation paid to their employees. The Company Alphalist bears vital employee information, such as full name, TIN, gross compensation, tax deductions, and other tax computations. By presenting such document, the visa applicant will be able to demonstrate to the Embassy that he or she is duly employed and has a stable source of income. Employees usally get their company alphalist and stamped BIR Form 1604-CF from their human resources personnel or employer. The BIR Form 1604-CF must be duly stamped by BIR. You may choose not to show your personal information in the alphalist such as your TIN. If your employer is not willing to furnish you a copy of the company alpha list (usually large corporations are unwilling in order to protect their employees' privacy), you may write a letter of explanation. Here is a template you can use. Those who are self-employed need only submit their BIR Form 1604-CF with corresponding receipt. Aside from announcing the removal of the company alphalist from the list of requirements, the Embassy also reminds applicants to take note of the new Korean visa application process, which will also take effect on July 1, 2018. Under the new procedure, walk-in applicants of the South Korea tourist visa will no longer be entertained in the Embassy. All applications must be submitted to a designated or accredited travel agency for processing. To see the list of travel agencies that are accredited by the Korean embassy, read: Applying for a Korean Visa Through An Accredited Travel Agency. Our new Korean visa application guide lists the contact details and processing fees for each designated travel agency. 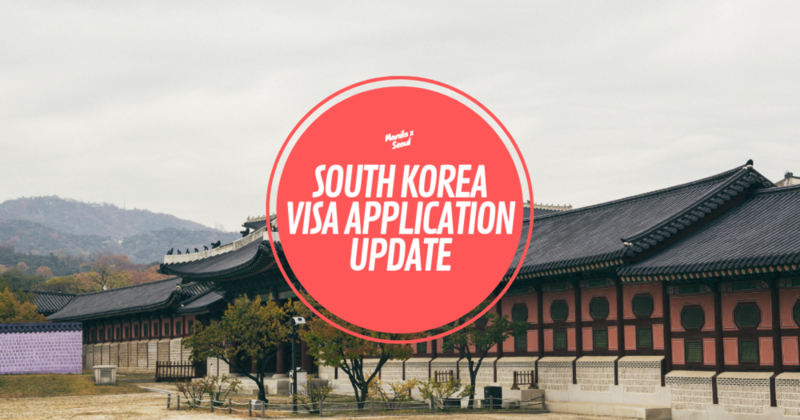 To view the list of South Korea visa requirements, click here. When you're ready to book your trip, you can view the prices of Korea travel essentials here. Here’s how much a 1-day ticket to Lotte World costs! For more information, like ManilaxSeoul on Facebook.